To purchase your silk banner/flag online, first select a design in our Online Shop, then click on a design to view the design in full detail to select your preferred format. Also see our other Worship, Warfare & Ministry Tools & Weapons. To really make an impact! 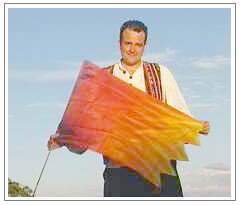 These large silk banners are ideal for a man or woman after God's own heart. Great for public worship indoors or outdoors. Can be seen from greater distances and make a very strong statement in parades, processions, performance. 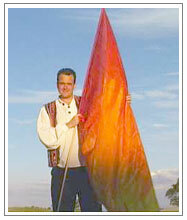 Large banners are particularly effective when used to minister to individuals and groups. Available in all our designs! When you're limited for space. These medium sized silk banners are ideal if there are low ceilings or confined spaces. They are useful for dance groups, having an impact outdoors and ministering to individuals. Very easy to handle for teenagers and older children. For children and very confined spaces. 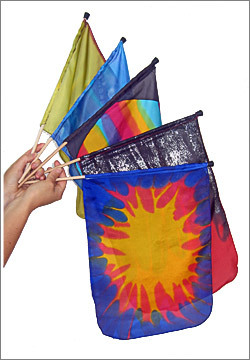 These smaller silk banners add colour and can be tucked away easily. Especially good for limited space and for children of all ages. They add a touch of colour without needing very much room. A moving, elegant prophetic statement! Classic gymnastic ribbons for the everyday. 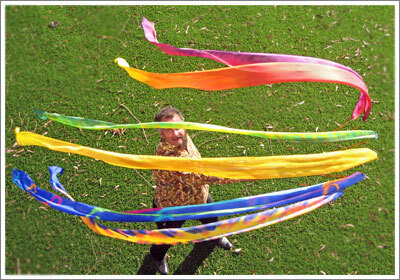 These silk ribbons are three meters long for easy use. Older children enjoy them. 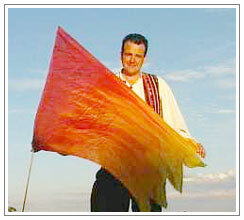 They bring colour and movement quite different to the traditional banners shape. Ribbons are available in most of our designs; however there are a few designs that just don't work as ribbons. You'll be as excited as we are about our brand new range of mini-banners! Measuring just 360mm by 260mm, these brightly-colored banners may be small in size but they are still big in power, proclaiming a prophetic message wherever they are unfurled. Introducing a whole new concept in banners, these mini-banners are ideal for use where space is limited or in private. They have the added advantage of being convenient to furl and carry, making them easy to conceal when on secret prayer assignments. Each of these beautiful banners is individually hand-painted on fine silk. Light-weight and easy to use, each comes with a small pole and safety rubber stopper making them safe for young and old. Our mini-banners are an excellent way of introducing children to the power of banners. An ideal size for small hands, they make a perfect gift and prophetic statement at births, baptisms, dedications or birthdays. Everyone, young in age to young at heart, will love them! Our mini-banners are available in a range of 15 designs or as one of three selected gifts sets, each with five related banner designs. The who, what, where, when, why and how of banners in the hands of Christians. This 222 page book offers foundational guidelines for use and etiquette, exploring WHO should use banners; WHAT they are, WHEN and WHERE they can be used and WHY they are important tools in God's Kingdom today. Wielding Banners for Worship & Warfare: The Who, What, Where, When, Why and How of Banners in the Hands of Christians. This set is a must for individuals and congregations that are serious about using banners in praise, worship, ministry and warfare. It presents over seven hours of teaching as David unfolds the “Who, What, Where, When, Why and How” of Banners in the Hands of Christians. After years of tinkering and months of design and development we have produced a strong and lightweight banner pole that is fully collapsible.